Artwork: Cover art by Charles Keegan. Cover design by Carol Russo Design. Maps by Elissa Mitchell. Interior illustrations used with permission of Wizards of the Coast. Additional interior illustrations by Sally Wern Comport. Interior ornament art by Matthew C. Nielson. Released by Starscape Books (an imprint of Tor Books), To the Blight is the second half of The Eye of the World in oversized paperback format (the first half is From the Two Rivers). 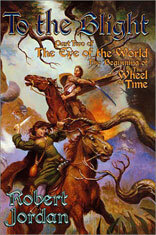 The book is intended for younger readers, and features illustrations licensed from Wizards of the Coast, the makers of the Wheel of Time Roleplaying Game. The text is unchanged from the original, but the print quality is rather poor. The books are printed on a cheaper newspaper-like stock, which tends to ruin some of the illustrations. The glossary is new for this work, and is most certainly written for younger readers (check out the entry for tabac). The type quality of the glossary is much better than the rest of the text.